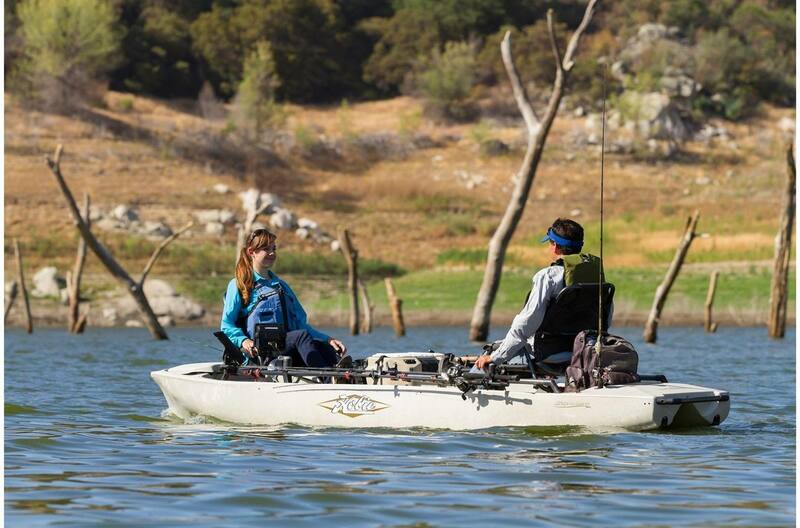 With innovative multiple seating options for one or two casters, the 17T is the king of fishing kayaks. 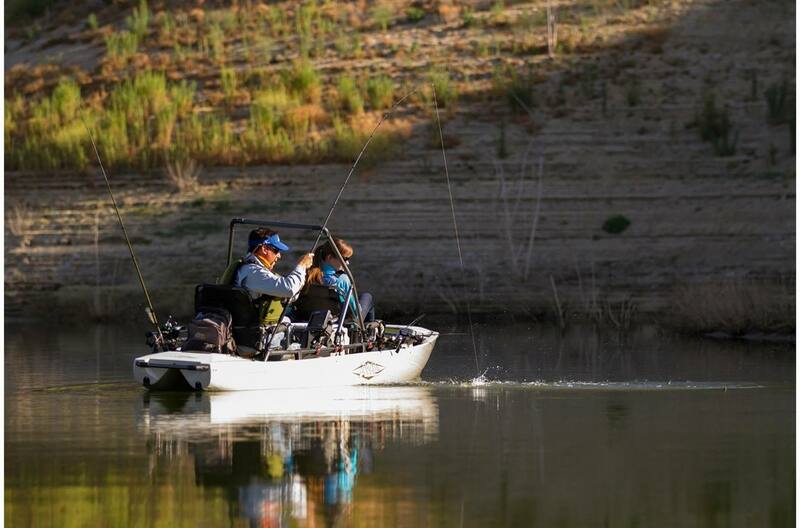 Set up the fully adjustable Vantage XT Seating (extra tall) in the in-line tandem configuration (guide style), face- to-face (ideal for fishing with small fry), or as a single (so much space! ); three steering handles cover all the possibilities. Fishing rod storage both front and rear holds an astounding dozen rods—bring the entire quiver. Customize accessory placement on more than 20 feet of H-Rail system. 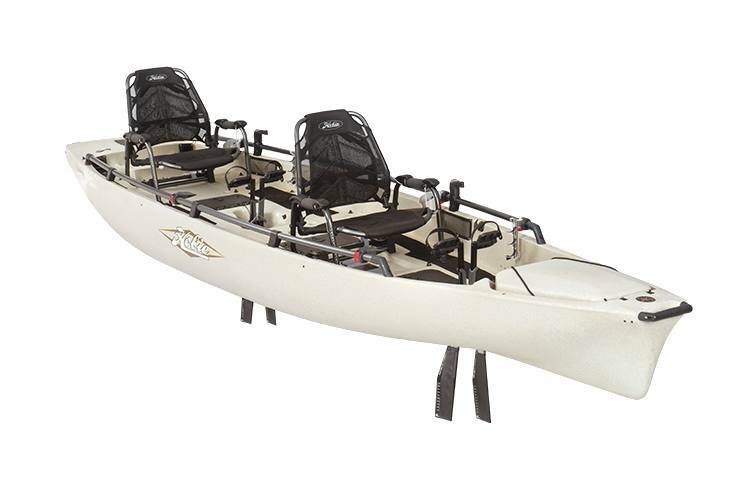 Both users can stand and kayak fish in comfort and each cockpit is fitted with a large rectangular hatch with pivoting tackle management system; there's even additional under-seat storage. An aft battery platform stands ready to house a 12v trolling motor battery, a cooler or crate to carry even more gear. Now available with the Guardian Transducer Shield, a retractable shield that protects your transducer on impact and retracts away for transport. Horizontal Rod Storage for 6 Rods: Protect your rod tips. 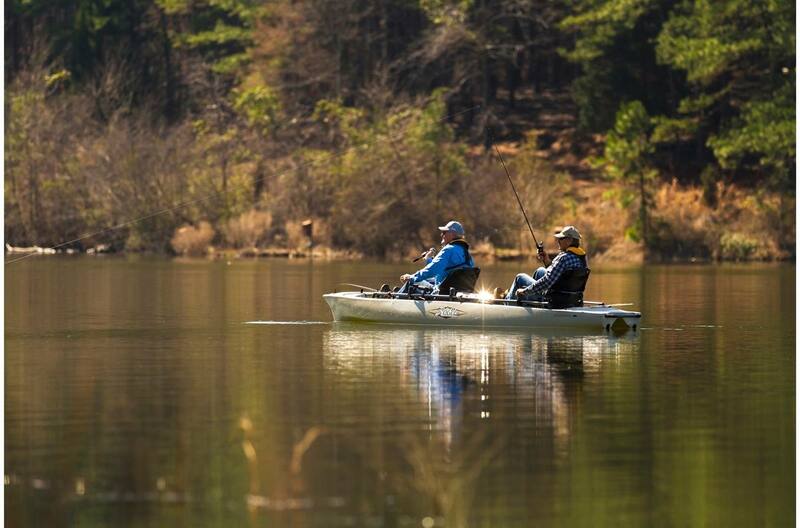 Hobie's horizontal rod holders keep your rods out of the way. H-Rail: H-Rail is a durable, lightweight, patent pending mounting system for quickly and easily securing a complete line of H-Rail accessories. 2 Fully Adjustable Vantage XT Seats: Vantage XT takes comfort to new levels with back, bottom, Boa® lumbar and kick stand adjustability. Made with breathable mesh and extruded aluminum, it lets your skin breathe naturally, while providing a strong and durable frame, in the boat or on the shore. Battery Platform: Specifically designed to house a large 12V trolling motor battery or for holding a small cooler or crate for bringing extra gear. 4 Horizontal Rod Holders: Protect your rod tips. Hobie's horizontal rod holders keep your rods out of the way. 2 H-Rail Mounting Plates: Mount almost any accessory to the H-Rail using this universal mounting plate. It's durable, easy to drill through and flat on the top and bottom, allowing bolts, nuts and washers to fit snugly. 2 H-Rail Cup Holders: Always have your favorite beverage conveniently located and secure. 2 H-Rail Horizontal Rod Racks: Designed for additional horizontal storage. Padding on the interior protects your investment, plus rod retainers secure your rods in position for easy access, surf landings or transport. When rotated, the Rod Rack can be used for storing other accessories like a paddle, sail or stakeout pole.